Yesterday when I went for my walk in the park, I was thrilled to hear that the song sparrows have returned. Their song is, for me, the essence of spring and summer. I think that's because the first time I was ever aware of them was on a vacation with my parents on the Cape. We were walking to breakfast one morning, and there was a song sparrow singing its heart out (or defending its territory) on the post of a fence that was supporting a blossom-covered rose bush. You can hear a song sparrow's song here, at the Cornell Ornithology Lab website. It's a wonderful site with all kinds of birding information. You'll need to click on the "song" button. 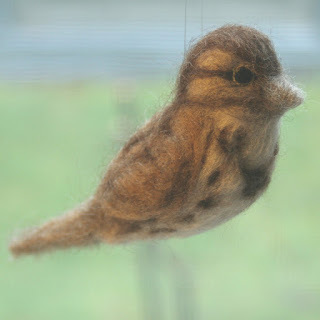 If you'd like to see more of my felted song sparrow, you can go to my Etsy shop. I was excited to hear on Saturday during my walk that wood-pewees have returned, too. I don't felt them as they are rather dull colored, but I love their cute little call of "pee-a-wee". Here's a picture. I tried to paste it in, but I don't think blogger will let me do that.